The Society’s annual calendar, Paintings of Freedom, highlights the work of gifted area artists and beautifully conveys the essence of our lovely town. These paintings tell a story of the town through the changing seasons of the year, from houses decorated for holidays, to magnificent views from hilltops, to a tranquil lakeside. 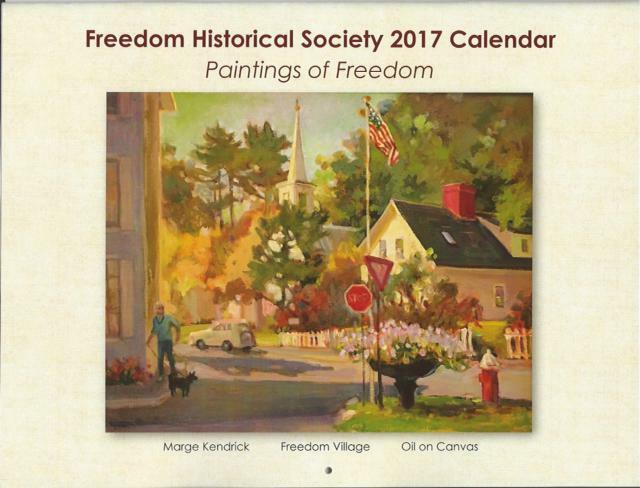 Look for these wonderful artists’ visions of Freedom in the calendar: Marge Kendrick, Peg Scully, Judy Fuller, Terri Brooks, JP Goodwin, Paula Kuehn, Valentina Kobalinsky, Rosemary Gerbutavich, John Shipman, Barbara McEvoy, and Nancy Essex. FHS is grateful to each one for generously granting images of their work to be reproduced in the 2017 Calendar. The calendar will be available for sale at various locations beginning June 25, 2016 at Freedom’s Rubber Ducky Day, the Freedom Village Store, and at the Museum during open hours from 10-12 on Wednesday and Saturday. 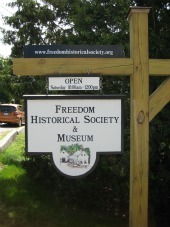 You can also purchase your calendar on our website at freedomhistoricalsociety.org. Support your historical society through purpose of this beautiful calendar. This is a limited edition of just 200 copies so don’t wait!